Before the growing demand for plastic products in the laboratory, glass products were widely used. However, glass products had several disadvantages such as brittleness, tendency to break thereby causing injuries and so on. However, these disadvantages were fulfilled for by the introduction of plasticware in laboratories. These plastics products offered several advantages over the traditional glass products such as longer shelf life, better handling, safety benefits and cost effectiveness. Globally, rising demand and acceptance of laboratory plasticware in cell cultures and cryopreservation related studies & experiments, upsurge in demand for plastic based equipment due to longer shelf life, better handling and safety benefits and cost effectiveness of plasticware are the prime growth drivers of laboratory plasticware market. However, lack of funds resulting in fewer research activities is the key restraint for laboratory plasticware market. The major opportunity for the laboratory plasticware market to grow is the rising living standards and improving healthcare facilities in emerging nations. However, automation and improved analytical instrumentation is the major challenge faced by this market. This report identifies the global laboratory plasticware market size in for the year 2014-2016, and forecast of the same for year 2021. 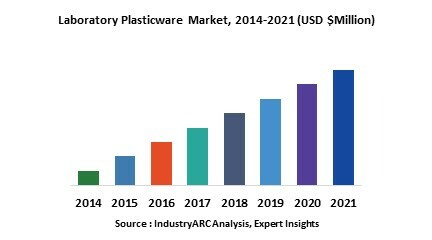 It also highlights the potential growth opportunities in the coming years, while also reviewing the market drivers, restraints, growth indicators, challenges, market dynamics, competitive landscape, and other key aspects with respect to laboratory plasticware market.